Children’s stories alway provide plenty of ammunition for the developers of online slots and the tale of the wolf and the three little pigs is no exception. Piggies and the Wolf is a Playtech release but also check out Big Bad Wolf for another fantastic example. It’s well worth sitting through the intro movie the first time you play Piggies and the Wolf; the wolf is the cool leather-clad character threatening the pigs who are in turn a stoner, a guitar playing redneck and a millionaire surrounded by gold bars. There are five reels, fifty paylines and a host of bonus features for your amusement; the symbols are the characters mentioned above plus their respective houses along with the standard 10, J, Q, K and A. This slot also features four rows of slots rather than the usual three. Bonus symbols include the wolf wild, and two bonus symbols which are a little spherical world and the game’s logo. Our groovy wolf is wild and he’s also stacked on the first, third and fifth reels; land him on reel five and if he covers all places on that reel, you’ll trigger this bonus. He will jump on his motorbike and ride across the reels, blowing as he goes and reassigning the symbols. There’s no guarantee that you’ll get a win but it’s like a free spin. this feature. 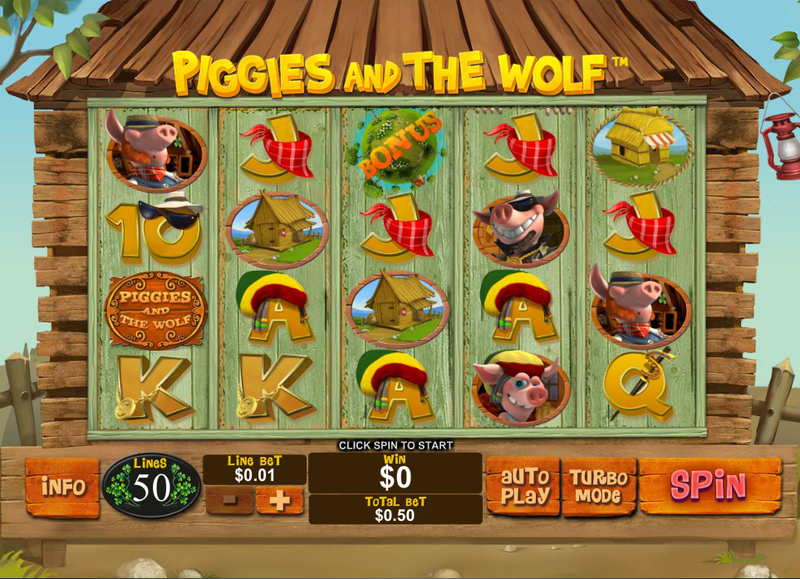 You’ll win 15 free spins Landing three of the game’s logo symbols on reels one, three and five will activate initially but the fun part is yet to come; if a pig lands to the immediate right of the wolf, the wolf will chase the pig off the reels, leaving a trail of wild symbols in his wake. The reels will then be re-evaluated for wins. You can also win an unlimited number of free spins by landing more bonus symbols during this feature. Three of the little world bonus symbols on reels one, three and five will trigger this feature and it’s a mini-game in which you must blow the three houses down in order – straw house, wooden house and brick house. You get three puffs per house and each time you blow you pick a symbol to help you; one of the symbols enables you to completely destroy the house. If you fail to destroy the house with you three puffs, that’s the end of the round. Destroying a house though will cause that occupant to run to the next house and you’ll then get a chance to destroy that one in the same manner. Make it to the brick house and the wolf will turn up on his motorbike. This time there are three identical gas tank symbols to pick from to help you. Destroying the brick house will award the big cash prize. You have to play with all 50 lines active which means there’s always a good chance of triggering a bonus feature – increase your stake if you feel comfortable to take advantage of those bonuses when they happen. * Fun Tip * Keep the sound turned on to make sure your hear all the funky sound effects and watch the intro movie at least once. Playtech seem to have made some big strides forward in creativity and this slot is a good example of why their slots remain so popular. It’s funny, contains quality graphics and enough bonus features to keep everyone happy.